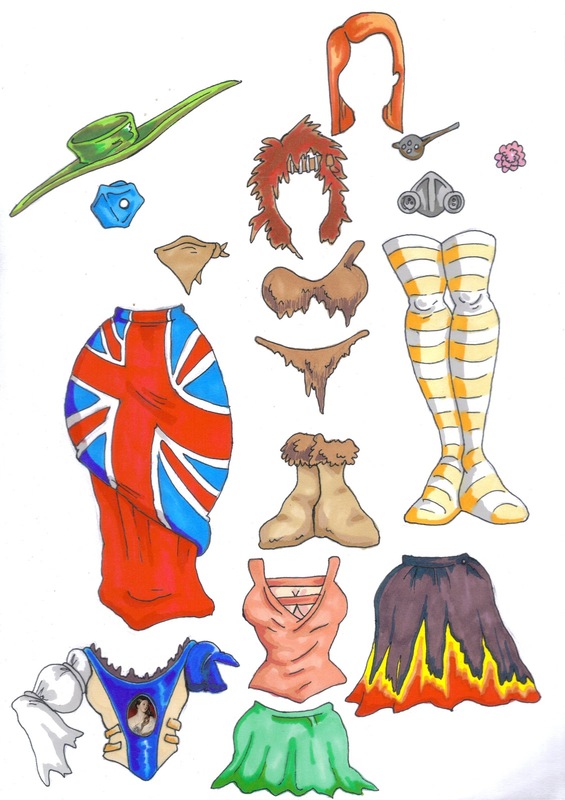 Another page of Emilly Ladybird dress up dolly fun, this week is a Patriotic ensemble to celebrate the Jubilee, and some other fun stuff. This Steampunk Brittania dress was displayed in all it's actual 3D glory at Kewbridge Steam Museums Exhibition! After a little experimentation, I have also discovered that repositionable stickers are absolutely perfect for creating a changeable costume doll without the need for tabs! This one from Avery is excellent (despite the rather odd sounding name). You get 6 A4 sheets in a pack and it works in a normal inkjet printer. Hi Miss Ladybird. Thank you so much for these beautiful dress up dolls. My daughter and I will love to dress her up, and maybe even design an outfit of our own for her. I am so glad you are enjoying them! I would absolutely love to see what outfits you come up with for my further adventures too!